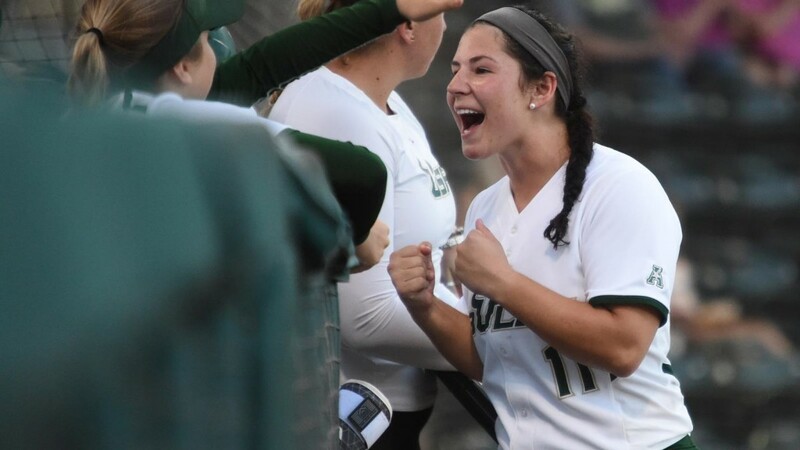 After more than seven scoreless innings, catcher Macy Cook’s walk-off grand slam won USF softball (23-12, 1-0) the first game of the series against Tulsa (19-9, 0-1) 4-0 in eight innings in the opening game of AAC play on Friday at the USF Softball Stadium. Cook went 1-for-3 against the Golden Hurricane but her only hit led to her first career grand slam. The Bulls gained momentum at the plate in the bottom of the eighth, when Megan Sheehan, Lindsey Devitt and Bethaney Keen hit consecutive singles to load the bases. With only one out, all Cook needed was a sacrifice fly or a base hit to win the game. She wasn’t even thinking of going for the grand slam. Corrick recorded a career high 16 strikeouts and struck out at least one in every inning and was two strikeouts away from the program record for single-game strikeout. She now has a total of 116 strikeouts in 85 innings this season. Corrick’s tight and consistent pitching throughout the game helped earn her 12th win of the season. Stamina wasn’t an issue for Corrick, as she pitched eight full innings, which tops her previous complete game record. The rest of the team was definitely appreciative of Cook and Corrick’s efforts, as Keen dumped cups of Powerade on the catcher and pitcher and Devitt showered them with a cooler full of ice after the game. With a win under its belt, USF will take the field against Tulsa on Saturday at 4:00 p.m. for the second game of the series.